Mount Baker blushes pink at the setting of the sun. Well, we were lucky to get up there when we did-- snow has already closed off the road to Artists Point. Now we'll have to wait for next year to explore the other trails! I was lucky to get this shot of the fountain at Elizabeth Park on what was possibly the last sunny day before the water is turned off for the winter. Three perpetually youthful girls perch on top of the fountain bowl, sculpted by Knute Evertz around 1910. Apparently there had been five larger female figures, all of which were lost when the fountain and park were in disrepair during the Great Depression. 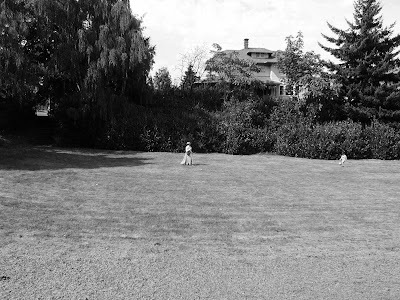 Elizabeth Park is the oldest municipal park in Bellingham. Sehome High School-- my own alma mater, as well as controversial talk show host Glenn Beck's. There has been quite the brouhaha around here this weekend as the polarizing celebrity came to his hometown of Mount Vernon, 30 miles south of Bellingham, to accept the key to the city. Beck lived in Mount Vernon for most of his childhood before moving up to Bellingham for high school and then on to Salt Lake City and fame (or is it infamy?) and fortune. The decision of Bud Norris, the mayor of Mount Vernon, to give Beck the key to the city was the cause of much debate around here, as many people disagree with rewarding such a controversial celebrity. Mount Vernon is rooted in agriculture, and like most farm towns, has a bigger share of conservatives. In contrast, Bellingham is a very liberal college town. Bellingham's mayor Dan Pike has responded to the Glenn Beck situation by offering Bellingham's key to the city to comedic (and liberal) talk show host Jon Stewart, who he went to high school with (albeit in New Jersey). Other notable Sehome alumni include: Oscar-winning actress Hilary Swank (who is not very popular with the locals because she never speaks fondly of her time in Bellingham), the members of the band The Posies, bestselling author Chelsea Cain, and the actor Billy Burke, who plays Bella's dad Charlie in the "Twilight" series. Corn tassels reach for the sky at a corn maze near Lynden, WA. A mother and son play at play in Broadway Park create an image that could have been captured yesterday or a century ago. This is Mount Shuksan as seen from Artists Point, up near Mount Baker. We haven't gone up there in so long, which is a travesty since it's so close and so beautiful! So we drove up yesterday afternoon and wondered why we waited so long, and made lots of promises that we'll come up and get some good hikes in before the first big snowfall. It was so warm yesterday we were in t-shirts until 7:00 up there, so the first snow seems a long way off. My sister Melanie snapped this shot of cyclists preparing for the annual Mount Baker Hill Climb in front of the Glacier Ski Shop. Cyclists start at the tiny town of Glacier and ride up to Artist's Point, which is the highest point you can reach on Mount Baker by bike or car. The cyclists climb 4300' in 24.5 miles. The Hill Climb replaces what used to be the DUMB ride-- Down and Up Mount Baker. I guess the acronym was too accurate! Love 'em or hate 'em, we have lots of squirrels. A lot of press has been given to the takeover of the Eastern Gray Squirrel in Great Britain and Italy, and the subsequent displacement of the native red squirrel. For some reason, it isn't as well known that we've had the same problem here in the Pacific Northwest. Our native American Red Squirrel has been driven out by the more adaptable gray squirrel, and I guess we've just thrown up our hands and decided not to do anything about it, because I haven't heard of any plans to try to fight it. Truthfully, I doubt we could do anything about it anyway. Also, we've also been getting a large influx of black squirrels making their way down from British Columbia. It used to be I'd only see them up in Vancouver, B.C., and then we started seeing them in Blaine, WA (which is right on the Canada-U.S. border) about five years ago, and for the last two years or so they've been popping up all over Bellingham. Apparently, they are just gray squirrels in which the white and black genes have separated in certain communities. I have seen black squirrels with gray tails or gray spots, which is pretty funny looking. According to Wikipedia, there are also white squirrels for the same reason. Has anyone seen white squirrels? I took this at Boulevard Park back in July, but it might as well have been yesterday-- we have been enjoying a warm indian summer, and the nice weather is supposed to last through the week. We 'hamsters like to get out and soak up the sun while we can. 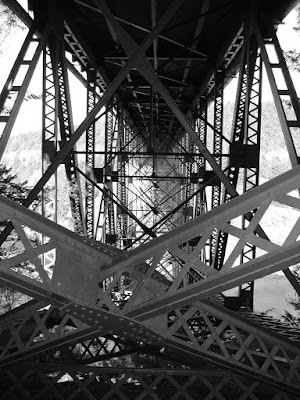 Under the Deception Pass Bridge on Whidbey Island. A faded mural advertising Rainier Beer in downtown Fairhaven. The Rainier Brewery building can still be seen from the freeway south of Seattle. This sign brings back fond memories of Rainier Beer's classic advertising campaign. I can remember sitting in the living room as a kid and always stopping what I was doing to listen to the Rainier Beer Motorcycle ad or the Rainier Frogs. Clouds caress the September moon. Click here to see other skywatchers. A sheep grazes at Hovander while Mount Baker looms in the distance. Continuing with the whimsical theme started Sunday... here is a local bus stop that some enterprising person decided to make a little more homey. All it needs is a vase of dahlias and a cup of tea. This table being sold at the Bellingham Farmer's Market is very cute. Mostly, though, I just like that someone changed the "I'm for sale" sign. I'm sure there's a good explanation for this but I can't imagine what it is. Any ideas? EjVig took this lovely shot of the moss growing on our garage roof. We should probably clean it off... but it is rather pretty. There's supposed to be a mountain there. Our lovely Mount Baker was being shy last week during the stormy weather. Pretty clouds, though, anyway! See other blogs watching the sky. The Fairhaven Village Green is right behind Village Books (Best. Bookstore. Ever.) and during the warm months is the location of lots of outdoor concerts and movies. My oldest daughter and I caught the very last outdoor movie of the year, The Princess Bride. On that occasion it was more the Village Rainbow than the Village Green, with the colorful array of sleeping bags and blankets and people. Alas, I didn't have the camera then, so you get this picture instead! A shack in the small fishing village on Lummi Island's Legoe Bay. A crowd gathers outside downtown's Mallard Ice Cream, a local shop that makes all their own ice creams. The line often stretches well into the sidewalk for a taste of one of their unique flavors such as "Black Pepper-Vanilla", "Rose", or "White Russian". Early morning traffic begins to make its way north on Interstate 5.
the darkness with her light. sleep lost among her shrouds. The lions will thrive again. Now that the end of summer is approaching, I appreciate this picture more than ever. This was taken in early summer by my friend Chad, who is a wonderful photographer. The boys bent, smiling. They picked the golden flowers. lay the dazzle and glitter of molten sun. "Every year," said Grandfather. "They run amuck; I let them. The theme day for today is BIG, and if there's one thing the pacific northwest has, it's big trees. This one, alas, only used to be a big tree... now it's a big stump. Still, it was big enough that it just about gave me a heart attack when I came out of our camper to find my not-quite-3-year-old on top. A big stump, but small enough for an ambitious little girl to climb! She did need help down, however.